Whether you’re religious or not, whether you like bunnies and eggs or not, Easter weekend is a cause for celebration. Starting with Good Friday, it’s a four-day weekend packed with colorful events. It doesn’t even require too much planning. Most of the celebration is out on the streets, where parades attract big crowds. You can basically enjoy Easter weekend almost everywhere, but we’ve selected five destinations across Europe that offer a unique experience. Milan, as on every other weekend of the year, offers its own version of whatever is going on, and Easter weekend is no different. But first – shopping! The Sinigaglia Fair is a Milan institution and the Easter edition is all that you can expect from hundreds of vendors offering furnishings, antiques and clothes on the banks of the Alzaia Naviglio Grande canal. Now since you are in Italy, what do you do after shopping? You eat. Don’t miss out on the gourmet Easter lunch that the city’s finest restaurants offer on Sunday. The elaborate affair mixes traditional and contemporary culinary techniques for an experience that is nothing less than memorable. The very first thing you want to do in Lisbon during Easter is have a traditional codfish dish on Good Friday. It’s the quintessential Portuguese thing to do. There are many variations of codfish, our favorite is bacalhau com natas, which is with a cream sauce. On Easter Sunday you should attend a mass. Basically all churches in the city perform an Easter Mass, and one of the most celebratory is the one in Sé de Lisboa – Lisbon Cathedral. After the Mass, you might want to have a walk uphill to Castle of St. George, an impressive Moorish castle with no less impressive views of Lisbon. Easter or not, when in Paris get ready to be overwhelmed by chocolate. Paris chocolatiers are going all out for Easter, with beautiful rabbits and eggs – almost too beautiful to eat! – filling their display windows. So get ready to feast your eyes on magnificent cocoa creations throughout the city. Don’t think for a minute that chocolate is all Paris has to offer during Easter weekend. If you’re into egg hunting, than Paris is your city! Easter egg hunts are taking place in numerous parks on a scale that is unmatched. In Parc André Citroën, for example, there will be 40,000 hidden eggs! To rest and rejoice after hunting and eating too much chocolate, there are fantastic concerts in spectacular settings, like the Sainte Chapelle‘s stained glass chapel, among others. 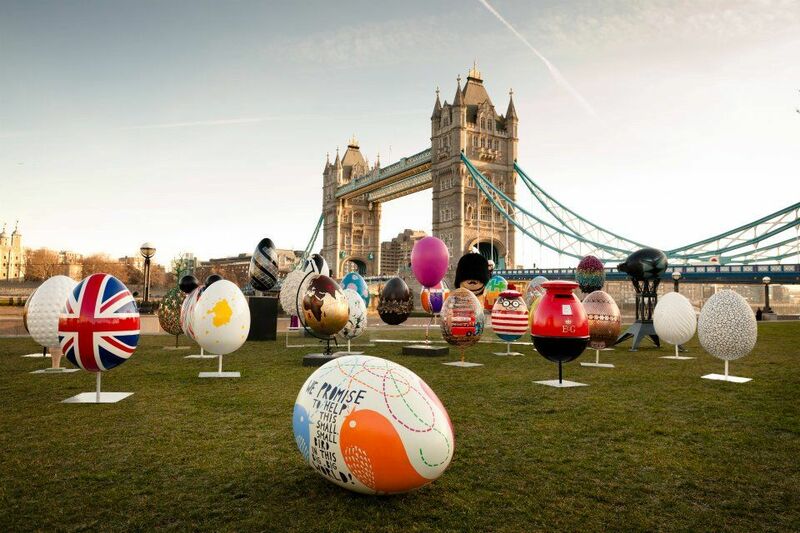 London might not be your go-to-city when thinking of Easter, but you’ll be surprised of the scope – and quirkiness – of the events in London during this four-day weekend. You can start in Trafalgar Square on Good Friday to witness the open-air re-enactment of ‘The Passion of Christ, complete with donkeys. To blow off some steam – and burn some calories along the way – you can join the “DeadDrop Chocolate Run”, which can only be described as kids-free scavenger hunt in the spirit of Easter. Running is optional, by the way. Still feeling energetic? Stop by Hen Corner where you can hunt for both real and chocolate eggs. Rumor has it that the hens there are especially susceptible to hugs, so don’t miss out on this once-in-a-life-time chance – when or where else could you hug a hen? And since it is London after all, there are numerous musicals, plays and magic shows to take the kids. You can count on Madrid to provide a lively Easter weekend. The most famous of Madrid’s Easter parades is the Cristo de Medinaceli (Christ of Medina), which takes place on Good Friday and runs through the main streets of the city from the parish of Jesús de Medinaceli. And it’s hardly the only parade in the city; basically everywhere you’ll go on Good Friday you’re likely to stumble onto a parade or processions, with saints dressed up in their signature white and purple attire. One more thing you must try during your Madrid Easter weekend – torrijas. Traditional Spanish Easter treats, made with bread, milk, sugar and cinnamon. Can’t go wrong with that.